One of the things we wish has been utilized more in the webOS notification area was the option to display a status bar of some sort. There've been a few apps, like Weather Dashboard (and its TouchPad-sized variant) or the Sports Live! apps to display sports game score alerts. But by-and-large, the quasi-widget status potential with the webOS notification area was never fully realized. The homebrew LunaCE improvements have breathed new life into the dashboard potential for the TouchPad, offering the option for taller, and thus richer and more interactive, notifications. Taking full advantage of that is webOS Nation Forum member and developer Garret92c, who has whipped up a nice clean dashboard app for your weather, appropriately titled "Dash Weather". The app lives in your notification area and is compatible with both webOS tablets and smartphones. Dash Weather uses webOS's location services to get your local weather, so even GPS-less TouchPad users can get localized weather information thanks to ballparking it off your Wi-Fi IP address. On a smartphone or standard TouchPad, Dash Weather displays the current temperature, forecasted high and low, and two other bits of your choice, including the location, current conditions (cloudy/fair/etc), sunrise/sunset, and more. But what really makes Dash Weather is the LunaCE option, allowing you to have a double-height dashboard widget. With that taller space you can display more info at once (duh), and it thankfully carries over onto a LunaCE-enabled TouchPad's lock screen too. 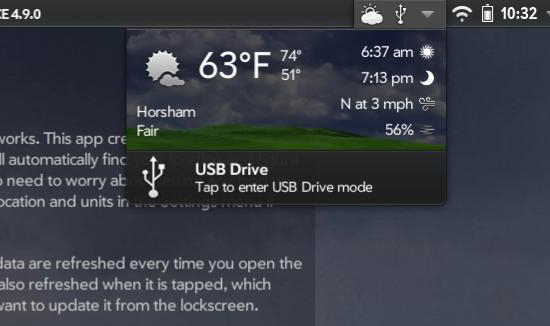 Dash Weather is available for free from the webOS Nation Homebrew Gallery, and through Preware and WebOS Quick Install. If you happen to like it, we recommend sending a donation the way of Garrett92c at the source link below.